Thought I'd get this up earlier this week, wondered if anyone would like to come join us for a spin around bedgebury. Meet at the main car park outside the bike shop ready to ride 10am. Planning on doing a couple of loops at least. But if people wanted to do more or less no one will be a offended if they split off and go their own way at some point. Not looking forward to this rain that they have now predicted for Sunday. 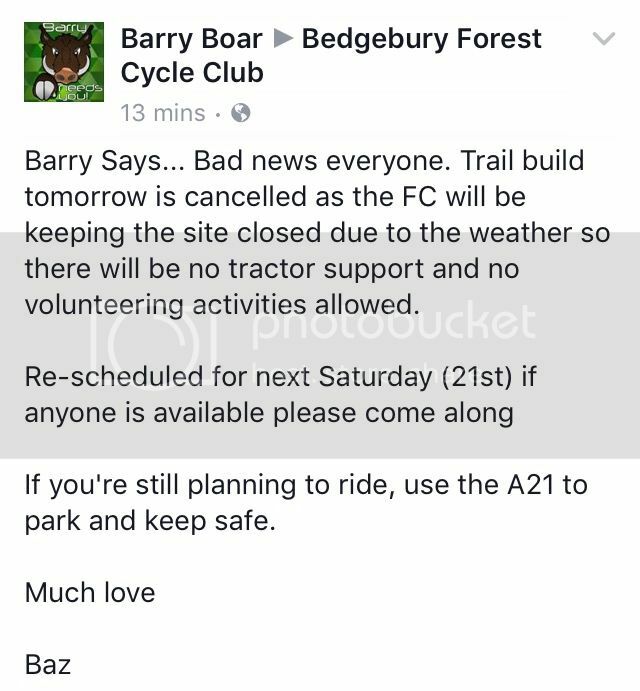 Quick heads up... Bedgebury car park will be closed on Saturday due to the (not particularly inclement for the time of year) weather. Keep an eye out for it to remain closed on Sunday ... just in case. I may join you BTW... just gotta find out my sons shifts for Sunday. We were planning on heading for a play in Surrey one day this weekend, but reckon it's gonna be particularly cold & miserable to go so far, so might stay local. Thanks for posting this. I think they will open the carpark tomorrow. Most of the snow will have thawed by now, and the weather will be clear all of tomorrow. All ready for Sunday. Thanks John will keep an eye on it. Be good if you can make it. Weather looks on the cold soggy side tomorrow, but I'm still good to ride. Wife's got other ideas Eont be able to make it I'm afraid. Ave a goodun. Not looking forward to the rain, but I'll be there still.